Finding ways to sneak greens into your diet may prove difficult, especially as the cold weather sets in, but these yummy recipes may just change your mind! Don’t fear, not all recipes have to be a block of cold iceberg lettuce with chunks of tomato, these recipes incorporate toasted nuts, cheeses and flavorful herbs and will help you easily get your servings of veggies. 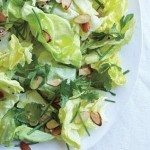 To make this tasty salad you will need ¼ cup sliced almonds, 1 large head Boston or Bibb lettuce, leaves torn (6 cups), 1 cup fresh parsley leaves, 1 cup fresh cilantro leaves, 10 chives, cut into 1-inch lengths and 4 to 5 tablespoons lemon and shallot vinaigrette or bottled Italian vinaigrette. Preheat your oven to 400F and place the slide almonds on a rimmed baking sheet and toast for 5 to 6 minutes, tossing occasionally until they are golden brown. In a large bowl, toss the lettuce, parsley, cilantro, chives in the vinaigrette and top with the toasted almonds. 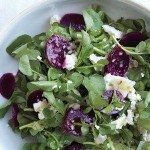 This salad is as easy as combining 2 bunches of watercress, a 15-ounce can of whole beets drained and thinly sliced and vinaigrette of your choice and tossing together in a large bowl. Sprinkle with feta for the perfect, bright-flavored salad. Consider adding toasted walnuts or raw broccoli to this salad for a nice mouth feel. The feta adds a nice pop of saltiness to the beets mild flavor and you can also warm the beets to make this salad a comforting fall lunch. Eating salads is about balance. Be sure to get in your healthy greens, but that doesn’t mean negate the flavor and fun by never adding things like crispy bacon! This simple and filling salad is ready in just 10 minutes. 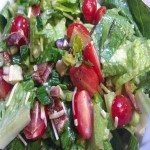 You will need 4 slices bacon, 1 head romaine lettuce, cut into strips (6 cups), 1 cup grape tomatoes, halved, 4 scallions, sliced, 4 to 6 tablespoons and creamy parmesan dressing or bottled Caesar dressing. To start, you’ll want to cook your bacon in a skillet over medium heat until crisped (about 6 to 8 minutes). Transfer to a paper towel-lined plate to drain the grease and crumble into pieces when cooled. In a large bowl, toss the lettuce, scallions, tomatoes and bacon with the dressing of your choice and voila! 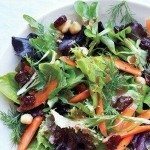 This great salad combines the sweet-sour flavor of dried cherries with the colorful crunch of sliced carrots and the healthy protein of chickpeas. To make, you will need 6 ounces mesclun (6 cups), 2 carrots, halved lengthwise and thinly sliced on the bias, 1 15-ounce can chickpeas, rinsed, ½ cup dried cherries, ¼ cup fresh dill sprigs, and 4 to 5 tablespoons balsamic-Dijon vinaigrette or bottled balsamic vinaigrette. From here, you simply toss all the ingredients together into a bowl and drizzle with the vinaigrette when you’re ready to eat, For another great option, consider warming the chickpeas with some smoked paprika and sea salt to add another depth of flavor. 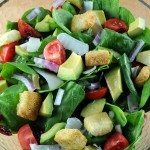 To make this salad, you will need 2 cups of fresh bread cubes, 1 tablespoon olive oil, kosher salt, 6 cups of baby spinach leaves, 1 diced avocado, 1 thinly sliced bell pepper, ½ cup pitted kalamata olive, 1 shallot, thinly sliced and 4 to 5 tablespoons of balsamic vinegar. To start, heat your oven to 400F and toss the bread cubes in the olive oil and a bit of kosher salt. Bake, tossing once, until golden brown and crisp, about 10 to 15 minutes. Meanwhile, in a large bowl toss together spinach, bell pepper, shallots and olives. Layer the sliced avocado on top and finish with the croutons. Liberally drizzle with balsamic vinegar to complete.